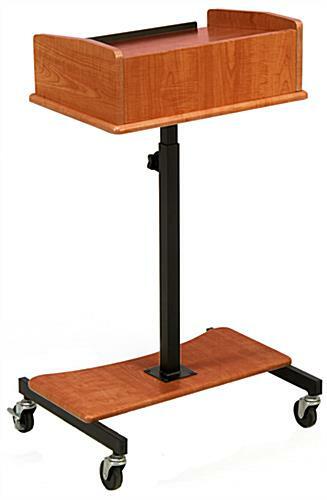 This wood-finish laptop cart with a cherry laminate surface and black steel accents features slide-out shelving for additional equipment to support a lecture. 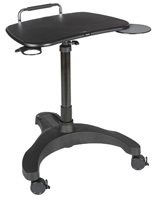 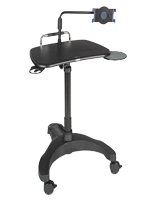 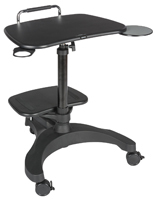 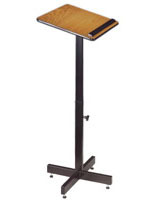 This adjustable stand for presentations supported by technical tools is the perfect speaking tool at a business meeting, in a school, or at a hospital lecture. 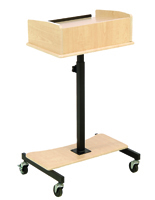 This laptop cart that is a mobile lectern has black caster wheels, two of which lock into a fixed position during a talk. 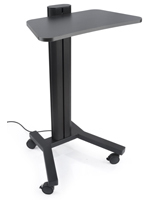 The beautiful cherry look draws attention to the speaker, while supporting associated AV equipment. 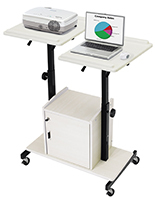 This computer cart adjusts from 39"-49"h and tilts 78, 85, and 90 degrees. 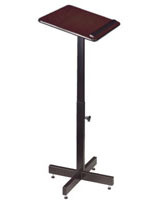 18.0" x 49.0" x 24.0"